Opening times: from April to September 7/7, 9:30am – 12:00pm and 2:30pm – 7:00pm. From November to March bikes are available by reservation only. Reservations can be made online or by phone. 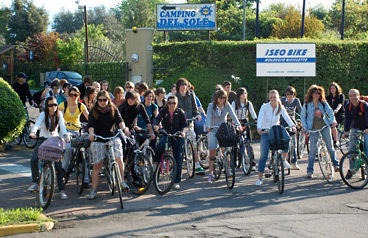 You find us in Iseo (BS), 26 Via per Rovato, at the entrance of the Campsite "Del Sole". Contact us by phoning the number +39.340.3962095, per Email info@iseobike.com or fill out the form below: we'll be back to you as soon as possible. Take notice: fields marked with an asterisk are required. In compliance with the Reg. UE n.679/2016 (GDPR). I authorise the processing of my personal data.